The Jerusalem Cross also known as the "Crusaders Cross" has four crosses on its corners symbolizing the outreach and commitment of the four Gospels proclaimed to spread to the four corners of the earth, beginning in Jerusalem. The large Cross symbolizes the person of Christ. 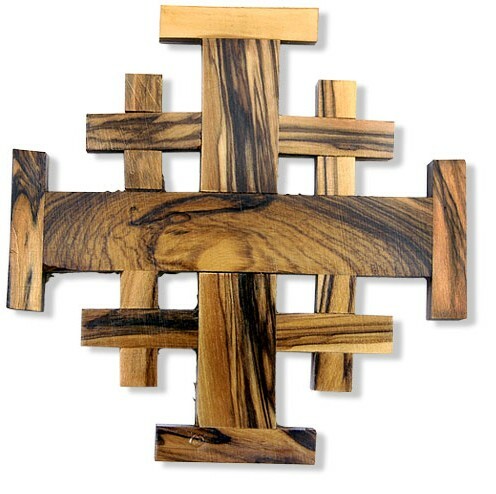 Handcrafted and made of pruned branches of the olive trees growing on the hills of Bethlehem and Jerusalem. Measures 4 x 4". Makes the perfect gift from the Holy Land for Christmas, marriage, or any occasion.